The Intermatic ET1105C 24 Hour Electronic Time Switch allows a program to be repeated on a daily basis. This great time switch provides dependable and uncomplicated performance with to the minute programming for extremely accurate load control while also offering reduced energy costs. The Intermatic ET1105C 24 Hour Electronic Time Switch offers 28 set points or events that can be preset to repeat automatically. The programming can also be disabled at any time by simply switching the time switch to manual operating mode. 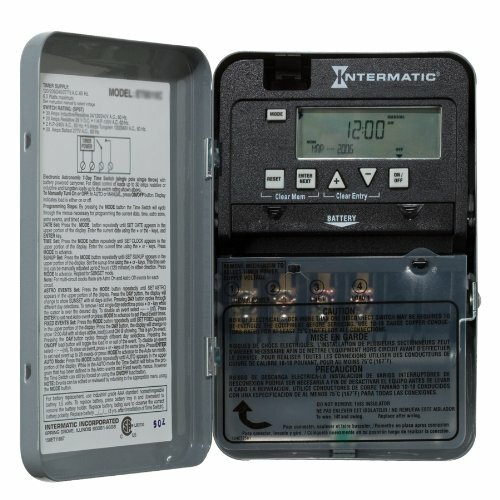 There are control buttons that provide manual control of each circuit independently, no matter the operating mode.The Intermatic ET1105C 24 Hour Electronic Time Switch includes two industrialgrade AAA alkaline batteries that provide time keeping as well as automatic carryover for at least three years. The batteries can also be easily replaced in the field and also do not require that the time switch mechanism be removed or rewired. The Intermatic ET1105C 24 Hour Electronic Time Switch is housed in a lockable enclosure that is designed to protect against unauthorized tampering and vandalism.